But see all those feathers lying around him? Within a few seconds of my arrival, he flew away. I guess he was done. I went outside to inspect. It appeared to be one of my Mourning Doves. The second one to have met their doom. I get torn sometimes about having feeders. Making my visitors easy marks. I know this guy needs food just like they do. He is one amazing creature ... I would feel the way you do and would rationalize its 'the circle of life', he was really giving you the evil eye, wasnt he .. its almost as if he is daring you to say something about his brunch! Wow, that is an awesome shot! I'm sorry for the morning dove tho. I know what you mean. "But still." Beautiful bird, though! And better him than the dang dove hunters. As I was typing a comment on how much I love your hawk photo, a wild turkey few up and landed on the fence just outside my office window. There's a group of them wandering through. Of course I do not have my camera upstairs with me. I'll just have to enjoy them all by myself. I love watching the wild life outside my window, and yours. Hey Reena, don't be upset, he does these things because he will get hungry. I feel sorry for the Mourning Dove as well, but, it happens. Good golly!!! 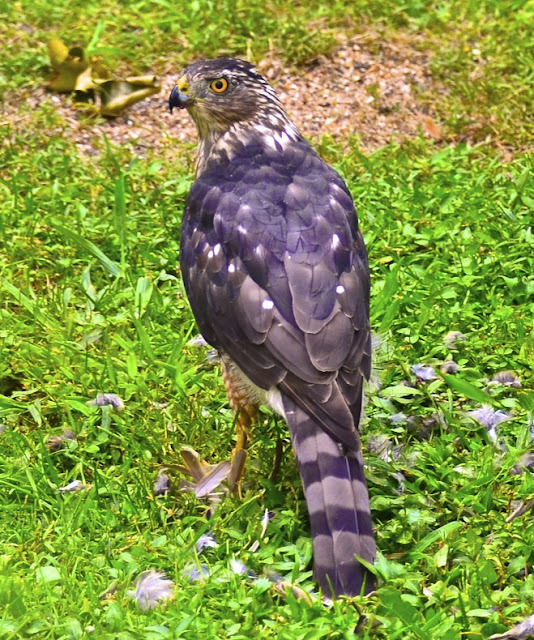 A hawk in a yard!! I can't believe the things you find, or should I say the things that find you! These are super pictures, the detail is amazing!! I try to just think of as they have to eat, and that it is only the weak ones get eaten!! Great photo! I don't know that I've ever happened here but if we love our birds I guess it's a risk we have to take. He may be a danger to birds, but he sure is an awesome creature. Nice capture! You got a great shot of the hawk's head. 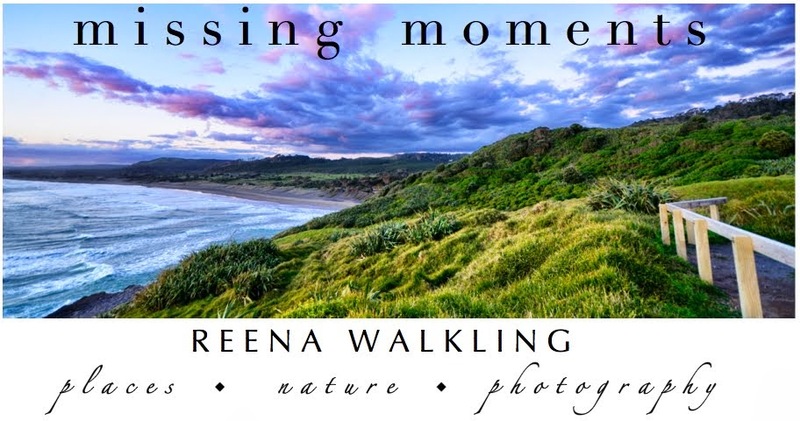 What a superb capture, Reena! And while he is a beautiful bird, it is hard to try to be practical regarding the food chain. I, too, hate to think of the ones lost! Hope your week is going well! Hmmmm....they are so fierce looking! I wonder if a bird got one of "our" doves recently? My husband and I found an area littered with feathers and down...and that's it! They were on the sidewalk behind his car. I had thought of a cat, but hadn't considered a hawk. We have Asian Collared doves as well as Mourning doves all over in town. Those doves didn't even see this guy coming. bless their hearts. I've only once seen a hawk chasing a bird near our feeders. It's unfortunate they feed on others, but they are stunning birds. ... says it all Reena...nature is both wonderful and shocking at the same time. 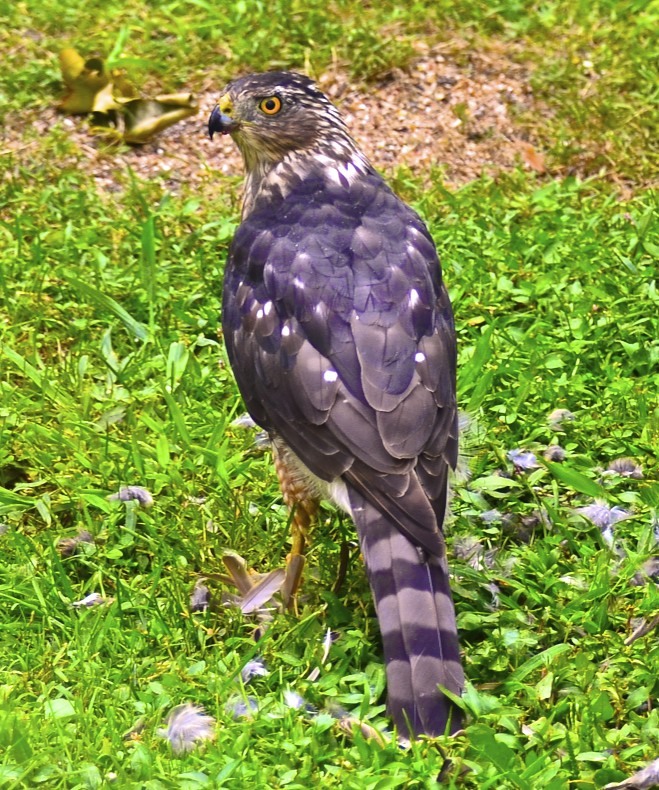 The sparrowhawk is the garden bird hunter in the UK. I have been happily watching the birds on the feeders.. then had the shock of witnessing a kill. It horrifies me for a while... but as Bob has already said I have just extended my birdfeeder to the whole of the natural world.. Sometimes it's hard to know what side of nature to be on. But I think when it's nature effecting nature it's not so bad. It's what is supposed to be. But when humans get involved...that's when the problems start. I know exactly how you feel. I've often said I didn't want bird feeders turned in to a predators buffet line. I nearly took all of them down several years ago when I witnessed a stray cat grab a Cardinal right off the feeder tray. It broke my heart....thankfull that has only happened once but like you I've seen feathers scattered about. I only let Hubby have a bird feeder out during the critical months of the year. December, until springtime. Brings too many unwanted critters to our yard otherwise. But the hawk is super cool looking. I feel the same way, i love our doves and the hawk goes for them first. he sits in the tree and as he eats the feathers float down into our pool and i fuss at him and tell him to go eat somewhere else. and the rest of your maine photos. you have managed to make maine look even more beautiful then it is. Wow! And yes, he need to eat too. And you know that mourning doves aren't the sharpest tools in the shed, right? Bless their little hearts. This morning while I was sitting out back watching the hummers, a cooper's hawk cruised right over the tree tops. Fortunately, the backyard buffet wasn't open and there were no likely targets to be seen. Over the years, we've had lots of them -- redetails, cooper's, red shoulder and harriers. Beautiful shot of the hawk. I guess he's just doing what he's meant to do. But still would be nice if he would give the other birds a fighting chance. Seems mean to nab them when they're busy eating. I was thinking the same thing. Don't worry too much, though. If they were out in the wild - which, of course, they are - your backyard is the wild - it would be the same. Nonetheless, heartbreaking just the same. Cheers reena!! I used to have a bird feeder when we lived in San Diego and many, many mourning doves would come and feed. Every once in a while I would see the same sort of thing. It broke my heart. I know it's nature's way, but I don't like to see it. Especially with mourning doves - such sweet, gentle birds. Oh, I know what you mean! When I found out my feeders could make easy marks of my beloved birds I had a tinge of regret for putting them out. Nature is not pretty sometimes! Those are some incredible shots. Nature does seem hard at times. Kind of sad, but you are right, he needs to eat to. Very nice photo of him. I will pretend those feather are from a pillow and go on with my happy thoughts. my neighbor has cats, that come in to my yard and "get" my beautiful birds...it just breaks my heart!! The coloring is so vivid - those eyes! Poor dove - the laws of nature, I guess. About 4 years ago we had a huge red shouldered hawk who decided to carry off Mr. Biggs!!!! Yes! Our 10lb Jack Russell!! It dropped him pretty quickly, but the poor fellow had some major muscle tearing, needed drains etc, but it could have been worse! Sad for the dove. . . but that's the food chain, I guess. Beautiful closeups of a magnificent raptor. Oh, Reena, so sorry about the mourning dove. That hawk is very handsome, I must say. Have a great weekend! Hi there - what a great picture of the hawk! I think I’m going to be a bit stronger than some of the other comments. I dont think it makes make sense to be sad when the sun goes down and I dont think it makes sense to be sad when a bird of prey kills its prey. And they ae both the same thing. OK, so that bird was in your garden because of food you left out - but the hawk would have killed another bird, somewhere else. 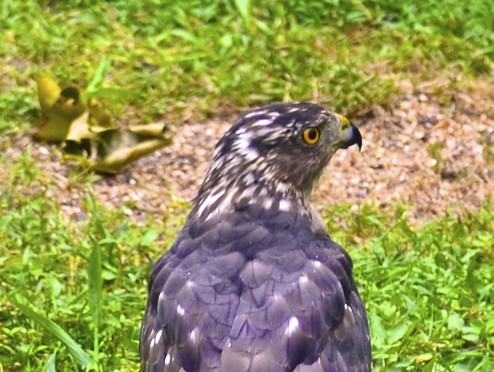 No feathers on the ground = no feathers on the hawk! Nature knows best...sorry to hear about your morning dove. One life given to preserve another. You get the best bird photos. What a gorgeous hawk. In your yard! Once in a great while, I get to see one of these outstanding birds of prey, but it is extremely rare. If I do see one I usually do not have the camera handy. There are times that I do find what is left of a dove or even a rabbit in our back yard. Can not prove that it was a Hawk or some other animal that met it's doom. Nice Images you've taken. WOW! Awesome shot of the hawk. I was helping my farmer buddy cropping corn Monday and a huge hawk sit in a dead tree next to the field we were in for over a hour. Guess it was hoping something would run out of the corn. I know what you mean Reena. I go through the same cycle here, and it's hard to know what to do. Somehow, I just can't bring myself to stop feeding the birds though. Yes, I share your angst. Awesome shots of the Hawk. I guess they do need to eat but do they have to do it in your yard.